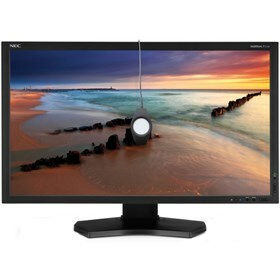 The NEC P232W-BK-SV is a 23" LED-backlit desktop monitor which is ideal for high-performance enterprise users. This eco-friendly monitor has 1920 x 1080 resolution and features IPS Panel Technology with wide viewing angles and ergonomic adjustability. The ControlSync™ Technology allows users to control up to six displays in a multi-monitor configuration, whereas the LED backlight provides low power consumption and less hazardous materials. The P232W-BK-SV features Smart sensing technology that automatically detects your work conditions to determine the proper display brightness with ambient light and human sensors. With 4 port USB hub, you can easily connect to your peripherals. This monitor has 178° horizontal and vertical viewing angle with 250cd/m2 brightness and also features ECO Mode™ that allows more power conservation and reduces energy costs. The NEC P232W-BK-SV has many exciting features for users of all types. See the NEC P232W-BK-SV gallery images above for more product views. The NEC P232W-BK-SV is sold as a Brand New Unopened Item.